Originally made for Bertone later model 1300/1600 GT Junior.Tested RPM & speedo=working smooth,euro KMH speedo installed in USA model cluster.Housing shape without distortion,very nice finish texture.Small cracks on attachment points,classic problem of original housings. 160 pages, colour & b/w illustrations, road tests, specifications., production figures, models, restoration guide. Complete original ashtray set.Chrome in good condition,new zinc on ashtray insert.Ribbed top shape on the lighter with white letters,i do not know if the lighter works. Alfa Romeo SZ/RZ(ES30) / Honda NSX-S Centre cover MOMO ZAGATODESIGN TYP V36. Finally available Alfa Romeo SZ/RZ(ES30)/Honda NSX Centre cover MOMO ZAGATODESIGN for steering wheel TYP V36 KBA.High quality repro with same look and feel.Ideal for replica Momo wheel.Shipping cost 8euro worldwide. Restored original centre heart,mirror shine finish!3x expensive hard copper plated on sandblasted potmetal,then nickel chrome.Bars are sanded and polished,a lot of time consuming work-the result is great.There are chromed pot metal casted reproducts on the market but low quality. The price is 340euro,paypal payment is possible but marked as family or friends-no fee. Housing surface was dull so i light sandblast it,then plastic primer,sikkens black autobase and 2k sikkens mat varnish-looks better then new.Plastic lenses are water sanded and then polished.Counter is set to zero,moving parts on speedo and rpm are oiled,backside attachment screws are replaced. 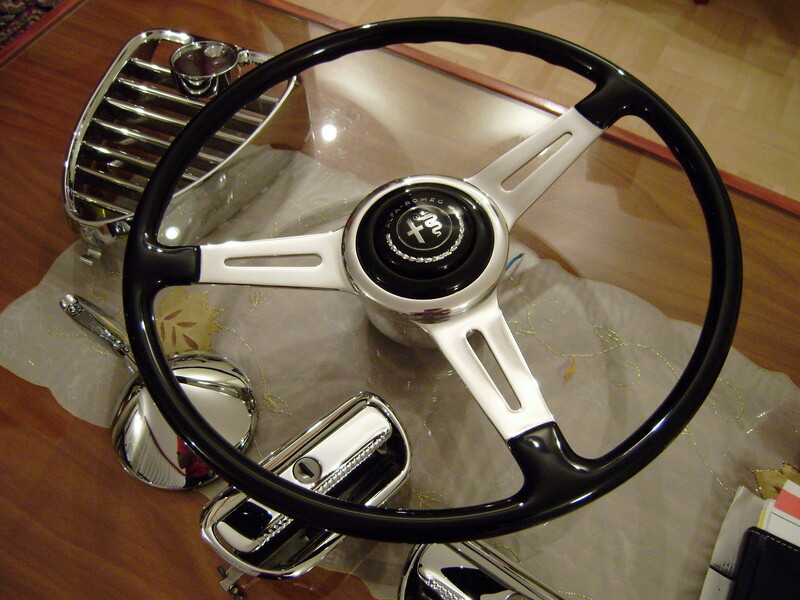 Restored Personal steering wheel for Alfa Romeo Giulia Bertone GTV 2000 /Spider.I saved original paint and polyester varnish on the wood.After spraying another polyester varnish the final coat is UV resistant 2k Sikkens clear varnish. Resprayed and polished original gold emblem.Spokes are sandblasted and sprayed with silver autobase colour,than 2k sikkens mat varnish.The result is great satin silver finish . All bars and inner housing were apart,sanded,polished,than back on silver soldered.A lot of work for this small original part but still easyer compare to spot welded repro-you can not disassemble it without damage on front cover. Alfa romeo Bertone GTV2000 Personal steering wheel.I saved original paint and polyester varnish on the wood.After spraying another polyester varnish the final coat is UV resistant 2k Sikkens clear. Resprayed and polished original gold emblem.Spokes are sandblasted and sprayed with silver autobase colour,than 2k sikkens mat varnish.The result is great satin silver finish .Horn aluminium spokes are sprayed with alu primer,after that the procedure is the same as steering wheel spokes. Original Sprint gt or sedan 2 serie horn button cap,water sanded and polished.After fine sanding and polishing inner side-black base sprayed and than 2k sikkens varnish.Small damage on metallisation (ring around chross and snake) but not so visible.Price is 60euro,shipping cost worldwide is 7euro. After small straightening and sandblasting parts were sprayed with 2komponent anticorrosion epoxy primer,than liquide 2k Sikkens filler.After wet sanding up to p2000- black sikkens auto base and finally Sikkens 2k mat varnish.After fine sanding again spraying with Sikkens 2k mat varnish .Finish is nice satin black.I bought chromed emblem Designo di Bertone on ebay.it for better look and to be something special.